‘The Olympic Champ’ is Goofy’s fourth sports cartoon. Here, Goofy demonstrates the athletic sports of the Olympics: running, hurdles, pole vault jumping, hammer drawing and the decathlon. 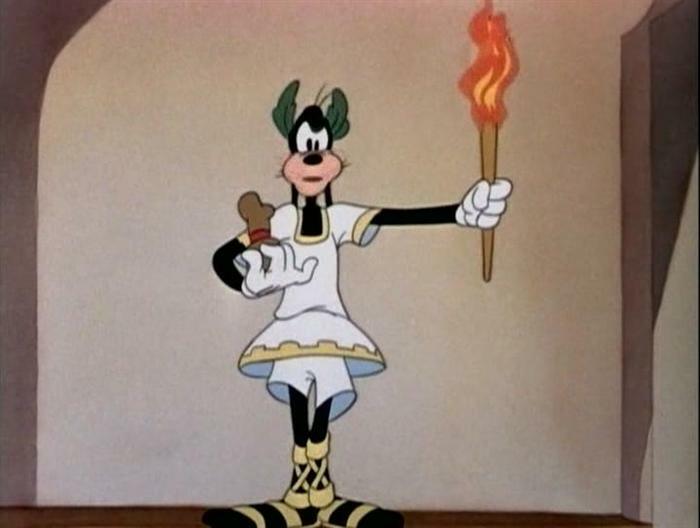 Goofy has particular problems with the narrator in this short: he’s almost burned by the eternal flame while the narrator pompously chatters away, and he has to try to balance on a pole, while the narrator is reciting a poem. ‘The Olympic Champ’ is not the best of Goofy’s sports cartoons, but it is enjoyable in its successful blend of blackout gags and great animation.